He is survived by his Wife; Shannon, Daughter; Kennedy, Son; Wesley. Parents; Joseph Costello, Alison Costello. Sister; Alanna (Ronnie) Rempel, Brothers; Jordan, Dillon, Josiah (Samantha) Costello. Maternal Grandparents; Rodney and Aneita Van Horn. Nephews; Landon, Arsen. Many aunts, uncles, cousins, dear friends. Brendon was a proud veteran of the US Marines. He loved spending time with his children, Kennedy and Wesley. 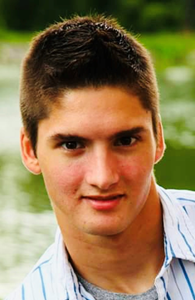 He loved the outdoors and was a soccer player for Brockport High School. Brendon was an amazing father to his children. He enjoyed fishing,and hiking and enjoyed life. Brendon will be sadly missed by so many he touched in his lifetime. Friends may call 10-11 am Saturday, April 6, 2019 at New Beginnings Christian Fellowship, 7397 W Ridge Rd, Brockport, NY 14420. Memorial services will follow visitation in the church sanctuary. Full military honors by the US Marines in Brendon's honor. In lieu of flowers, a trust fund is being arranged for the children's education in Brendon's memory. Please check the website for a donation address in the near future. To leave the family a condolence, click the above link "view guestbook". Add your memories to the guest book of Brendon Costello. To the Costello family- I am so sorry for your loss. Your family will always be in my heart from my childhood. May you find comfort in God and family at this most difficult time. We cannot begin to express our sorrow for your loss, these are the times that test our faith please know that you and your family are in our thoughts and prayers. Our thoughts and prayers are with you and your family during this difficult time. Today and always, may loving memories of Brendon bring you peace, comfort, and strength. From Adam, Nick and Stan Kowalczyk, our thoughts and prayers are with You and your entire family. God Bless. I am so very sorry to hear of Brendon's passing. My prayers, thoughts, and sympathy go out to you Allee! I've had the pleasure of Brendon sitting at my dinner table listening to him laugh and talk with my boys and their friends. I pray God gives you comfort in this tragic time. Peace be with you, Shannon, Kennedy, Wesley, Joe, Jordan, Josiah, Alanna, and Dillon. Again, I am so very sorry for your loss! From my earliest memories, Brendan was one of my first best friends and felt like a brother to me from the start. I remember girls used to chase us around the playground in kindergarten. Brendan and I always had a close relationship no matter how far away we were from each other as we got older. I had a great time visiting him in DC after he moved down there. I also had the pleasure of hanging out with him with the little time he had visiting home before he went back to DC and I moved to Australia. We kept in touch every so often. I would love to meet his little ones someday. I was very sad to hear this and would have loved to see him when I visit home. My heart goes out to all of his family, his children, and any of his friends and loved ones who are affected by Brendan's death. May he rest in peace and I know I will see him some day again. My condolences to his family and friends. May he rest in peace. Semper Fidelis brother. We extend our deep and heartfelt sympathy at the passing of your dear Brendon. Costello family, I'm so sorry to hear about your loss. Brendan was such a wonderful young man. I had the honor of being one of his soccer coaches for 10 years with the Blizzards. We all have such amazing memories of Brendan and the boys together. Our last tournament together, Bendan was in boot camp, so the boys put his jersey on the bench. Rest in peace #3. We will all miss you , until we meet again. Heaven has a new soldier of God celebrating and cheering in his ranks today. Thank you for your service while on this earth. You will not be forgotten son. I am so very sorry about Brendon’s passing... so sad and tragic. May God’s love and comfort surround you in the days and years ahead and may Brendon be in God’s eternal presence. I will be praying for all of you. Such sad news, we are so sorry for your loss, thoughts and prayers to all the Costello family. ALLEE, THOUGHTS AND PRAYERS ARE WITH YOU AND YOUR FAMILY. We went to boot camp together and he was always the guy that was smiling, laughing, and always got us in trouble with the drill instructors which now that I think about it, they really didn’t even mind. My sincerest condolences to his family, friends, and children. Semper Fidelis, Marine. I am so very sorry for your loss. He was a wonderful young man. My thoughts and prayers to your family. Our deepest condolences and sympathies in your darkest hours. My heart is is broken over the loss of your precious son and brother. I had not seen Brendon in years but I will always remember how kind hearted he was and for the beautiful smile he had. He was such a gift to you all as you all were to him. I pray the Lord hold you all in the palm of His hand and give you the all the grace you need for each day. May you allow your suffering to be united with His. Brendon, you were a good man and father. I know in my heart that you are at peace with our Lord. You will be missed by so many people. Until we meet again.